The DrawProfitEA MT4 EA is a forex expert advisor. 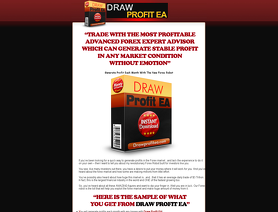 The Draw Profit EA automated forex trading software for the MetaTrader platform places trades for you. The DrawProfitEA.com forex robot trades on EURUSD and GBPUSD pairs with 5 minutes time frame. Good return within two months. Good ability to generate consecutive returns. Gains regularly distributed on time. Inconsistency, lot size vary sharply, doesn't' fit small account sizes. Money management impacted by the above inconsistency.